I went to this screening by accident and it was only afterwards that I learned that this was the most anticipated Polish release of the year. It opened in Poland and in the UK and Ireland on 21 September and you still have the chance to see it at selected Cineworld multiplexes. The title refers (I think) to one of the songs by Hip Hop trio Paktofonika who were active between 1998 and 2000. The film is a music biopic of sorts covering the short career of the trio from Silesia in industrialised Southern Poland. It’s always fun to watch a film with absolutely no pre-conceptions. I don’t know a great deal about Hip Hop and I had no knowledge of the band. Because of this I relied on what I knew of youth pictures and social realist dramas. 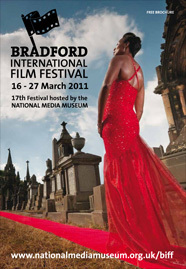 In some ways the film reminded me of Flying Pigs (Poland 2010) the football-based drama shown at this year’s Bradford Film Festival. Since I didn’t know this was a true story, I did wonder at one point if this would become a social realist drama rather than a music film. I compared it to Ken Loach or Shane Meadows, the Dardennes Brothers and other realist filmmakers. It is presented in a CinemaScope frame and there is heavy use of shallow focus, especially against the grim housing estates of Katowice. Also, the palette seems to have been reduced to greens, blues and browns to emphasise the drabness. It seemed both stylised and observational in its aesthetic approach and I was interested to learn that the director Leszek Dawid trained at the famous Lódź film school, specialising in documentaries. 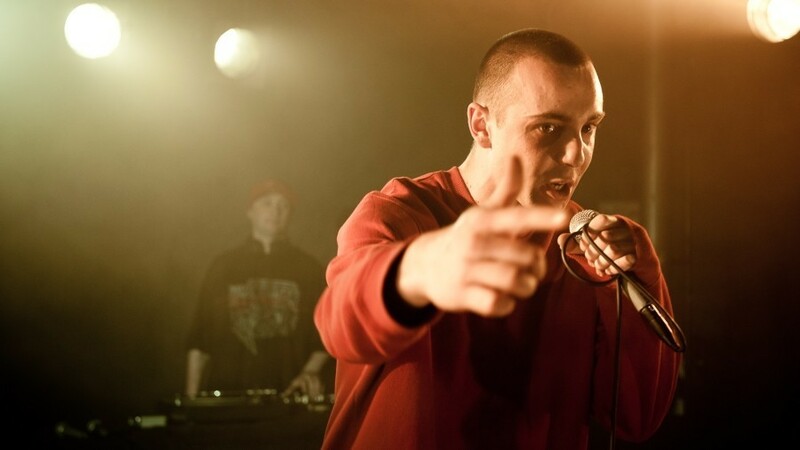 He won a prize at the Gdynia Polish Film Festival for this film and prizes also went to Marcin Kowalczyk as ‘Magik’ and Dawid Ogrodnik and Tomasz Schuchardt, the two supporting actors playing ‘Focus’ and ‘Rahim’. My feeling certainly was that these three young actors – and the other performers playing friends or family – were some of the strongest elements in the film. There are some similarities to the UK film Control (about Joy Division) and I was quite impressed by the music, even if I don’t know much about it. The weakest part of the film seemed to be the script (remember I didn’t know it was based on a true story) and I didn’t really understand why it ended as it did. I was relieved to see that the festival reviewer felt the same way. Find out more about the true story and the coverage of the film in the Polish media on Culture.pl and the Polish Cultural Institute. The surprising feature of the Culture.pl coverage is the reference to the importance of the film in critiquing ‘degenerate Polish capitalism of the post-transformation era’ and the attack on consumerism (i.e. the band’s ‘art’ against the consumerist society). The festival review also refers to the film’s script as being claimed as a “post-1989 Man of Marble” (the famous film by Andrzej Wajda), but then finding its statements about consumerism naïve. I guess we are so used to these kinds of narratives in Anglo-American films that the anti-consumerism didn’t really register with me – it just seemed like a conventional element in a music film about ‘rebel’ musicians. Another lesson about watching films more carefully and more objectively perhaps? 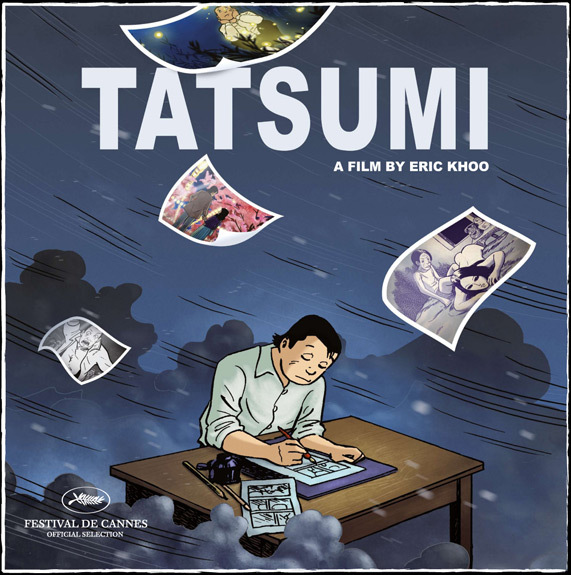 Tatsumi is a rather wonderful film that was released domestically in Singapore after winning plaudits at various festivals. It’s an unusual animated film that successfully manages to combine a biography of a Japanese manga author with representations of several of his stories to produce a coherent narrative. But as director Eric Khoo remarked after its screening here in Oslo it still has to go to the Tokyo International Film Festival and that will have a bearing on how the film fares in the Japanese market. It’s due out in the UK in January 2012 via Soda and international sales are stacking up via the German agents The Match Factory. The Oslo screening was accompanied by an exhibition of the original artwork used in the film and introduced by Eric Khoo himself. 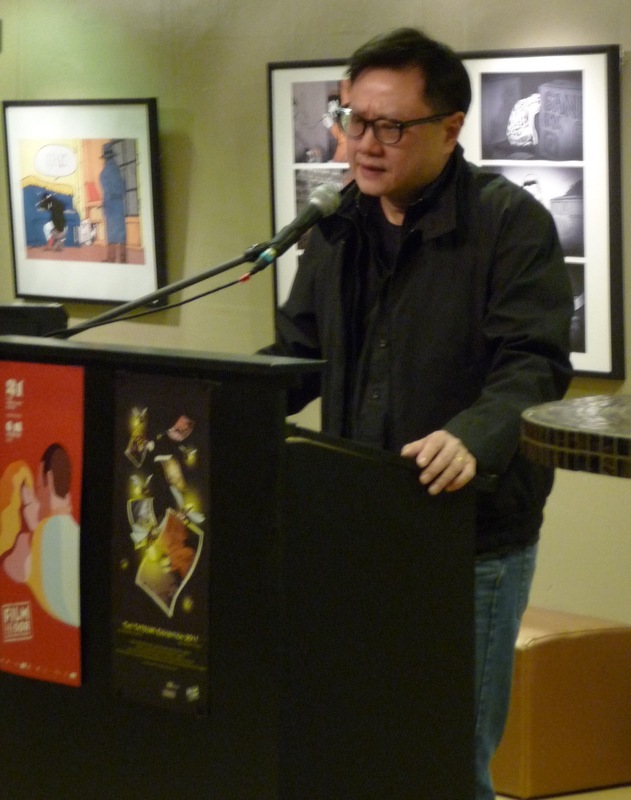 Eric Khoo introduces his film with some of frames from the exhibition visible behind him. Eric Khoo was once himself a comic book artist but he had not thought that he had the patience to undertake an animated production . . . until he read the autobiographical manga, The Drifting Life by Tatsumi Yoshihiro published in 2009. See this website for previews of Tatsumi’s work in new Canadian published editions. Tatsumi (born 1935) became associated in Japan with a new form of manga dealing with much more realist themes and named gekiga, a term Tatsumi is said to have originated and which was taken up by some other writers. This might be seen as similar to the development of ‘graphic novel’ as a term in North America. Khoo’s problem was that he didn’t speak Japanese and he knew he must get full co-operation from Tatsumi himself. He managed to arrange an interview via a friend at Fuji Film and managed to convince Tatsumi that any film that he made would be faithful to the Tatsumi drawing style. Tatsumi was a young teenager in the immediate post-war period in Japan under the Allied Occupation. His first success as a manga story-teller came early and he was inspired by both competition from his brother and by meeting one of the leading manga/anime figures of the day Tezuka Osamu. But eventually Tatsumi tired of what he felt were the constrictions of manga aimed primarily at children and he developed the gekiga form in the late 1950s. Interestingly he returned to his memories of the immediate postwar period in his new work. Stories such as ‘Hell’ (the aftermath of the Hiroshima bomb) and ‘Goodbye’ (about a prostitute whose clients are American GIs) set up a tone that is also present in more contemporary (i.e. 1970s) stories about alienation from work and family in ‘Beloved Monkey’, ‘Occupied’ and ‘Just a Man’. I’m fascinated by these two periods of Japanese Cinema (and literature) so I found these stories – and the surrounding material relating to Tatsumi’s struggles to get them published – very engaging. It will be interesting to see what kinds of audience reactions the film gets on its international release. I would hope that it would receive as much attention as Marjane Satrapi’s Persepolis, but I think that film has a much more recognisable story and theme. I would urge you to give Tatsumi a go. I’m sure that you will recognise some of the images from Japanese Cinema and then find the story of Tatsumi the artist as interesting as I do. Angels of Evil is a stylish Italian entry into the crime biopic genre which has seen a recent resurgence with the success of the two Mesrine films starring Vincent Cassell. It’s also related to another recent biopic, the mammoth take on the international revolutionary criminal Carlos. But perhaps it is best considered alongside recent fictional crime sagas such as Animal Kingdom, Un prophète and Gomorra. The central character in Angels of Evil is Renato Vallanzasca, a Milanese street kid born in 1950 who gravitates towards bank robberies and eventually becomes Italy’s ‘most wanted’ partly because he becomes involved with the deaths of police officers. The film begins with one of his many prison terms and then reveals his story in flashback. What is noticeable is the extent to which Vallanzasca’s no doubt partly romanticised biography so closely resembles a typical crime genre narrative. For instance, his gang includes his blood brother from the streets, Enzo, a man who may have learning difficulties but who is certainly a highly dangerous companion, and his ‘little sister’ Antonella from the same background. Renato’s parents remain supportive throughout (it seems barely credible that in one of his breakouts from prison, Renato goes to his parents’ flat). Generically, the film is very close to Mesrine and Renato is represented as almost a Robin Hood type figure, a generally honourable character who shows up the inadequacies of the police and prison service and appeals directly to the public. I was reminded at times of the idea of the Italian ‘outlaw’ figure and Eric Hobsbawm’s ideas about ‘social bandits’. I haven’t seen Francesco Rosi’s film about the Sicilian bandit Lucky Luciano but I wonder if there are any parallels. Vallanzasca is not a rural bandit of course. But his street origins in the early 1960s do mean that he is an ‘outsider’ and one of the narrative strands in the film deals with his attempts to oust the more established crime families in Milan. I’ve seen criticisms of the film complaining that given its time span (primarily the 1970s and 1980s) it doesn’t say enough about the changing nature of organised crime in Italy. I confess that I couldn’t keep track of all of the action in the film and the various groups from different crime organisations but I did note that Renato (like all ‘old-time’ criminals in genre films) bemoans the young thugs and their mindless violence, believing that he himself was ‘honorable’. I’ve just finished reading an Italian crime fiction novel about the Calabrian criminal families and I was intrigued to see that they get a mention here alongside the Sicilians. I thought Angels of Evil was an enjoyable (if very bloody) genre film on a par with Mesrine but lacking the intensity of Un prophète or Gomorra. The central performance by Kim Rossi Stuart is its strongest element alongside the two young women played by Valeria Soleano and the Spanish actress Paz Vega (as Antonella). The multi-lingual German actor Moritz Bleibtreu plays one of the gang members. Rossi Stuart also starred in director Michele Placido’s earlier crime film Romanzo criminale (2005) – a very similar package about a criminal gang in Rome in the 1970s which I haven’t seen. Overall I have to agree with a reviewer who suggested that the film reveals a cast and crew who most enjoyed dressing up for the 1970s/80s scenes. Angels of Evil is that now rare beast – a widescreen ‘popular’ European genre picture that struggles to get even a limited UK release, even though it was part-produced by Fox International Italy and Canal+. Once, such films, often dubbed, received a wide release in the UK. Ironically, Italian domestic production is on something of a roll at the moment scoring multiple hits at home. Angels of Evil opened at No4 in the Italian Top 20 in January 2011 (when 4 out of the Top 5 were Italian ‘domestic features’). When it dropped out of the Top 20 after four weeks the film had taken $3.76 million. It might do quite well when it opens in France in September. Yaroslav (Aleksandr Ivashkevich) leads his men into another small settlement in Iron Lord. This is the second recent pick-up of a Russian historical biopic by the UK distributor Revolver for a DVD release, following Admiral which we reviewed a few weeks ago. Both films were released in Russia by 20th Century Fox. 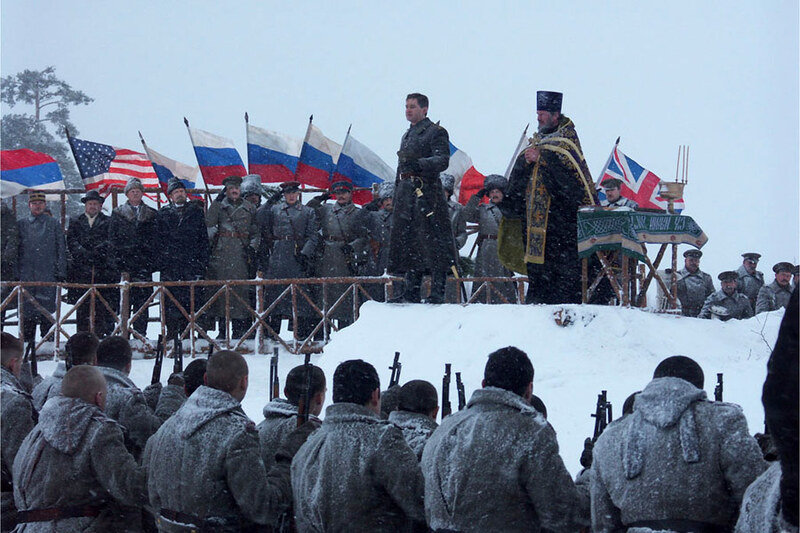 As with Admiral, the film appears to be an ideology-driven film celebrating one of the first leaders to unite the principalities that would eventually become Russia. In some respects therefore the premise for the film recalls that of Zhang Yimou’s Hero about the king who first united China – though the actual narrative is quite different. 1010, the steppes of western Asia/Eastern Europe. 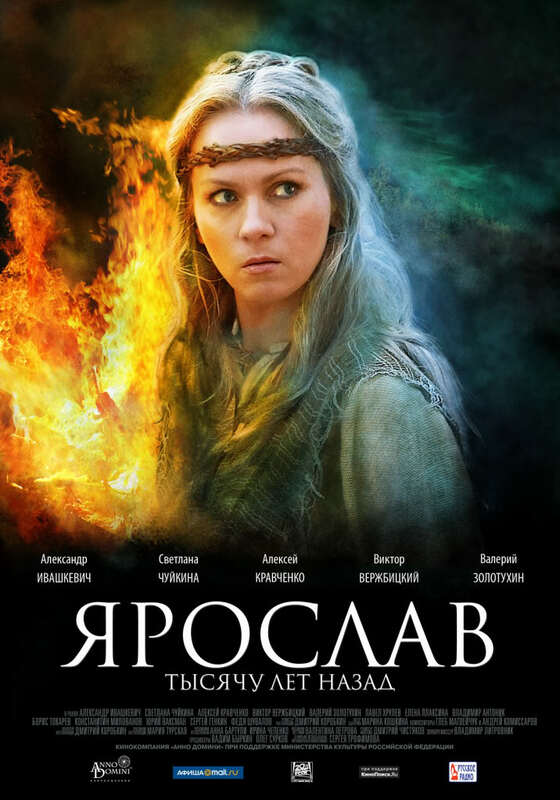 The central character is Yaroslav (hence the Russian title of the film) son of Vladimir, ruler of what was in the early eleventh century, Rus’ or Kievan Rus’, with its capital in Kiev. Yaroslav is given the task of ruling the furthest territory controlled by his father, the wild lands of the North East around Rostov. Kievan Rus figures in Russian history as a ‘medieval polity’ that saw a concentration of power amongst the ‘Eastern Slavs’ before the invasion of their lands by the Mongols in 1230. Kiev is the capital of present-day Ukraine and Rostov is a city in modern Russia some 200 km North-East of Moscow. Rostov is a key city in Russian history and this film celebrates the founding of the city of Yaroslavl, now the major city of the region, 1,000 years ago. Yaroslav has to find ways of gaining the trust of the local tribes (so that they will pay ‘tribute’) and fighting off marauding bandits who take prisoners to sell as slaves after being taken down the Volga River. Yaroslav has a central plan to build a fortress in the new territories. The local tribes are pagan but Yaroslav is a Christian and the fortress will also represent the solidity of Christianity. This narrative focuses specifically on a tribal group who worship a Bear god (veles) – a symbol of later Russia? The control of the area is further complicated by the actions of the Varangian (Viking) mercenaries who act as Yaroslav’s personal guards. In Hollywood terms, this might be a ‘sword and archery’ type of film or a medieval epic – the time period is similar to that of Robin Hood and the Crusades. The presentation of Yaroslav is not unlike that of the Russell Crowe character in Gladiator, especially with the (rather confusing) references to his family. However, the strategies adopted by Yaroslav are also similar to those of a ‘liberal’ commander of the US Cavalry attempting to establish order in ‘Indian Country’, i.e. an imperial mission. Intellect’s Directory of World Cinema: Russia (ed Birgit Beumers, 2011) suggests that the ‘historical film’ has always been a major genre in Russian Cinema in both Soviet and pre- and post-Soviet periods. A second key genre is the action film which the Directory terms the ‘Red Western’ – an allusion to the way in which popular Russian films have borrowed aspects of Hollywood genres extensively since the 1920s. Iron Lord can be seen as an attempt to use these two genre repertoires as the basis for a conventional biopic about an important historical Russian figure. 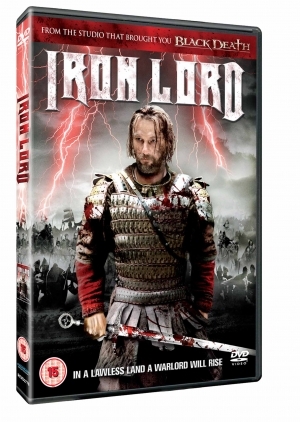 Re-branding the film Iron Lord strikes me as misleading. Yaroslav is almost the opposite – he is ‘wise’ not brutal in this narrative and he spends much of the time in captivity or negotiation. Of course, few people outside Russia will know who Yaroslav was so the Russian title probably wouldn’t work either. The film was released in Russia on 550 prints and also has had a release in Ukraine and Germany. It lasted only one week in the Russian Top Ten so presumably audiences are too engaged with Hollywood product to lap up this kind of patriotic film. Revolver announce that the film is “from the same studio that brought you Black Death“. I’m not sure what this means – I couldn’t find any link between the two films. On the other hand, there has been a recent cycle of UK/Nordic/German films of this type (the most recent being Ironclad, 2011). I couldn’t find much about any of the cast and crew. Most seem either to have come from TV or to be new to the industry according to IMDb. What I did find, however, was that a Soviet era version of the story was adapted as a 156 mins film in 1983. I’d like to see that for comparison. I wonder what happened to all those popular genre films made by Soviet era studios? Picked up by Metrodome for a UK DVD release, Admiral is an interesting example of the new Russian popular cinema that is now emerging in one of the fastest growing cinema markets in the world. This month Screen International has a feature in which analysts predict that the Russian box office will grow to as many as 300 million admissions by 2015 (from 165 million in 2010). If this happens it will see Russia as the fourth biggest market behind India, US and China. However, most of this growth is due to Hollywood blockbusters and local films still struggle to compete. Admiral has been the second most successful Russian film of recent years (taking $33.7 million in Russia) and it involves some of the same cast and crew as the other two most popular films The Irony of Fate 2 and Day Watch. The other important institutional factor to note is that the film is actually a 2 hour cut from a 10 hour TV mini-series. That’s an extreme form of compression by anyone’s standards. The Admiral of the title is Aleksandr Kolchak (1874-1920), an important historical figure in Russian history. Kolchak was first a polar explorer and then a hero of both the Russian-Japanese War of 1904-5 and the First World War naval engagements between the Imperial Navies of Russia and Germany in 1916. It is with these engagements that the film’s narrative begins. During celebrations of a naval victory, Kolchak meets and falls in love with the beautiful young wife of his friend and deputy. – much to the dismay of both his friend and his own wife. Following the Tsar’s abdication, Kolchak managed to retain his authority (largely through being sent to America to help the US Navy). He is able to return to the Russian Far East where he seizes control of the White Forces in the Civil War against the newly formed Red Army. Throughout this period his new love Anna attempts to be with him while his wife and son are in exile in Paris. 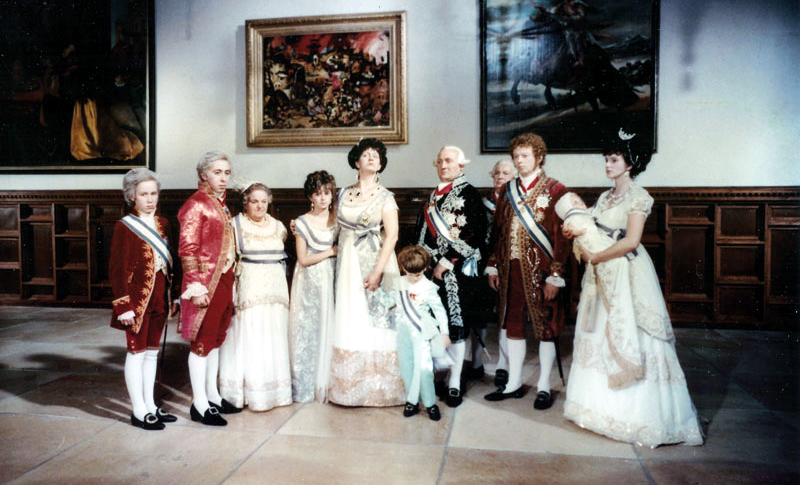 The film narrative is book-ended by a scene set in the Mosfilm Studios during Sergei Bondarchuk’s production of War and Peace in 1964. Anna, who survived the Civil War but was then imprisoned, is now able to appear in public – but is a role in a ‘patriotic film’, even as an extra, appropriate? An expensive production ($20 million according to Wikipedia) Admiral certainly looks the part – although it suffers like most modern ‘spectacular films’ from the problems of CGI battle scenes. Visually, it works best as a costume drama. The major problem is clearly the compression of the narrative which inevitably means that the story leaps about through time and space. I confess that apart from the two leads, I found it difficult to track certain characters through the narrative. Partly this was because of the strange experience of watching naval officers transmuted into army officers. If you don’t know the history of the Russian Civil War, I recommend at least an outline scan of events before watching the film. (The film does not purport to be an exact historical reconstruction.) It’s difficult to work out the extent to which the balance between the war combat/military planning narrative and the romance has been affected by the compression. I suspect that purchasers of the DVD expecting an epic combat film will be disappointed by the way in which the romance comes to the fore. 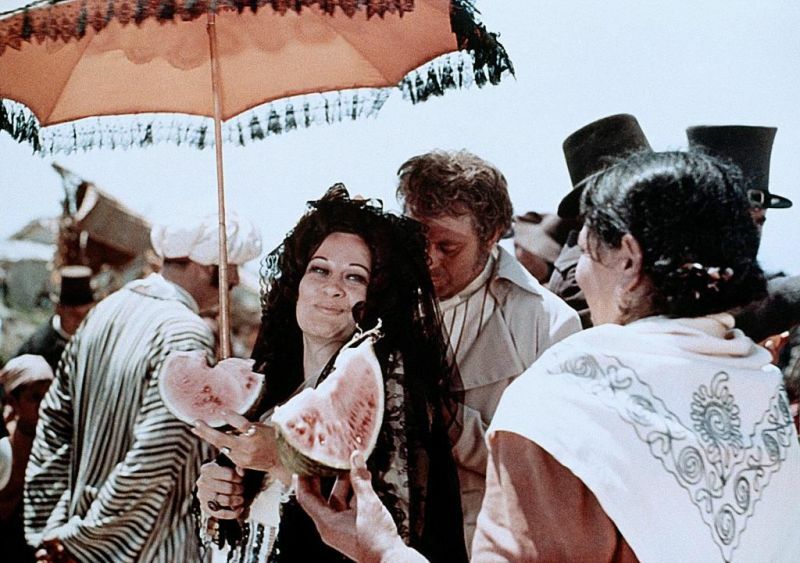 The romance fails for me because Elizaveta Boyarskaya who plays Anna is certainly beautiful but appears to have little else in her performance that represents the passion the character feels for Kolchak. Konstantin Habensky who plays the Admiral is perhaps the most popular contemporary Russian actor and is believable as the central character, although he looks a little young. The obvious films that audiences in the West will use for comparison are Dr Zhivago (1965) and War and Peace (King Vidor 1956). Ms Boyarskaya doesn’t stand much chance up against Julie Christie or Audrey Hepburn. For me the most interesting aspect of the film is its ideological work. It’s always an odd experience watching a film in which you find yourself being asked to follow the exploits of the enemy when your own side is not being shown. Not that this is impossible since I’ve never really had a problem with supporting Sergeant Steiner and his men in Peckinpah’s Cross of Iron even if they are part of the Wehrmacht fighting the Red Army. But that’s because they are professional soldiers simply trying to survive and ignore the Nazi officer who they distrust. In the case of Admiral, however, we are asked to support a man who became what some commentators have termed a proto-fascist dictator as ‘Supreme Chief of Russian Forces’. His own ideology seems to be church and ‘homeland’, expressed in patrician and aristocratic terms. The film makes no attempt to humanise the Bolsheviks and they are represented as little more than thugs in most cases – apart from some of the guards in the final sequence. I did quite like the ways in which the guards struggled to find different ways to address the Admiral in the new language of the revolution. ‘Mr Kolchak’ was the last one I think (according to the subtitles). It’s a shame that the film doesn’t give us the whole story as Kolchak’s early life is intriguing. A character with more shades to his personal character might be more interesting. As it is this seems like a crude attempt to valorise a Putin-like figure. Channel One was a major funder of the film and I think this TV channel is still majority owned by the Russian state. Possibly the TV mini-series has more nuances and contradictions but if you want a corrective to this view of the Civil War I recommend Miklós Jancsó‘s The Red and the White (Hungary 1968). One last point – the image at the head of this post shows the British and American flags. There is, I think, little knowledge in the UK of the part played by Churchill in particular in sending British forces and encouraging other allies to support the Whites in 1918-9 and to try to strangle the Russian Soviets at birth.